One of my favorite traditions is carving pumpkins into jack-o'-lanterns each October — there's just something magical about the end result in my book. This year was no different and we can say with confidence we have carved the pumpkins without any major pitfalls this year! Last year we realized creating designs throughout the pumpkin with a power drill was not only a beautiful and creative way to decorate pumpkins, but it's actually really simple and makes those thicker varieties much easier to work with. 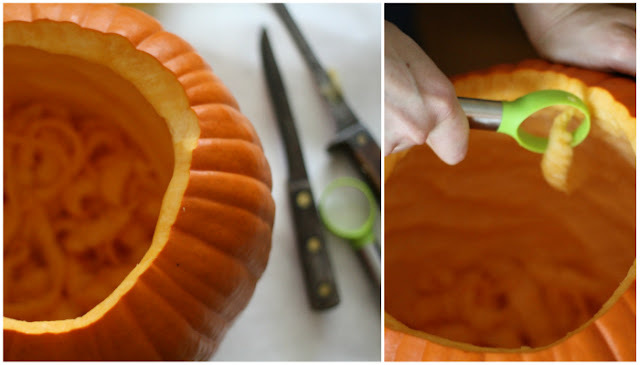 Cut a circle around the stem with a sharp knife and gently pull from pumpkin. Clean up topper for pumpkin and scrape innards completely clean from inside the pumpkin. 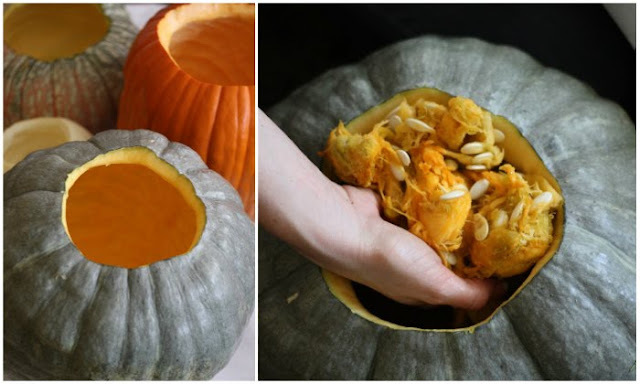 This is the perfect opportunity to save the seeds from your pumpkin and any excess "meat" to incorporate into recipes later. While I'm pretty laid back about most things, I am a stickler for a very clean and thinly walled inner pumpkin. One of the ways I achieve a super clean look is once all the guts and seeds are removed, I use a fruit scooper to literally scrape strips of the pumpkin meat from the inner walls. this allows for easier carving, a clean look, and makes me feel like I'm getting every last morsel of good pumpkin to use for later. 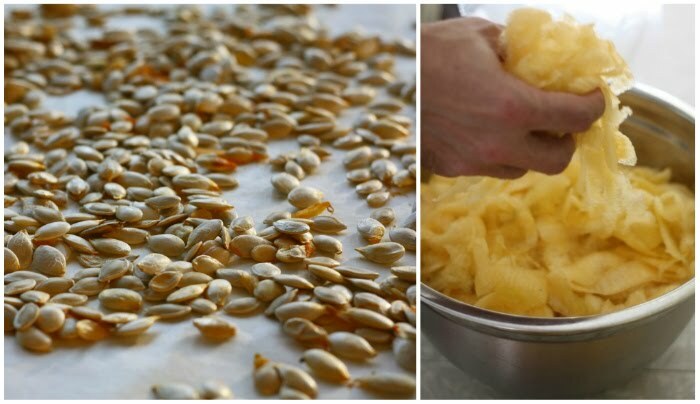 Once pumpkins are completely cleaned and prepped, it's time to get down to business. When drilling a planned design, it's a good idea to mark your pumpkin in each area where a hole should go. I used a sharpie marker to make sure the ink didn't bleed. 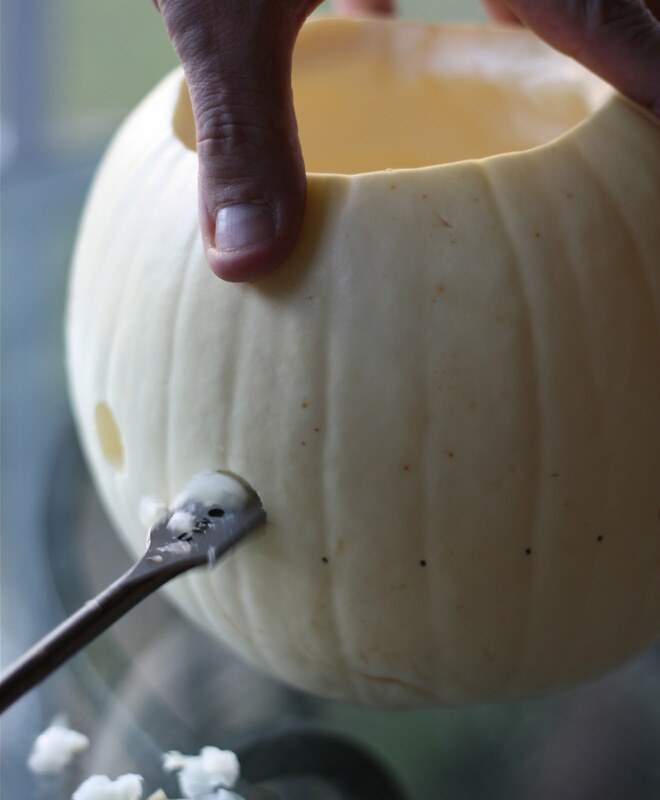 Tip: it's really easy to wipe any mistakes away with a little dab of nail polish remover — the marker will vanish and leave the outside of your pumpkin intact. Once marked and happy with your design, bring out the power drill! You can use different sized drill bits to achieve a variation of hole sizes fitting your design. When in doubt, use a larger size drill bit since the smaller sizes are tough for the light to get through when lit up. 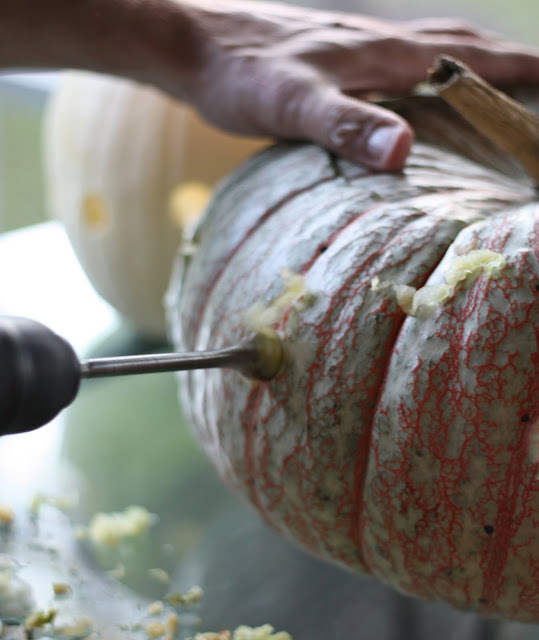 Simply place drill bit against side of pumpkin over your marked areas and drill completely through to the inside of the pumpkin. Repeat as desired. I must note it's a good idea to do the drilling outside since little pieces of pumpkin will fly everywhere — Tim was in charge of drilling here at 17 Apart. 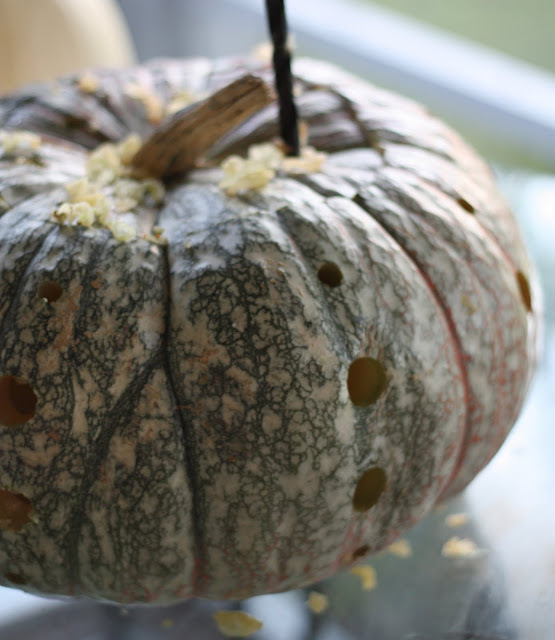 Simply clean up any pumpkin pieces from the inside of the pumpkin and wipe inside & out with a wet washcloth to ensure each drilled hole is clean and clear. At this point, you are ready to test out your new jack-o'lanterns! 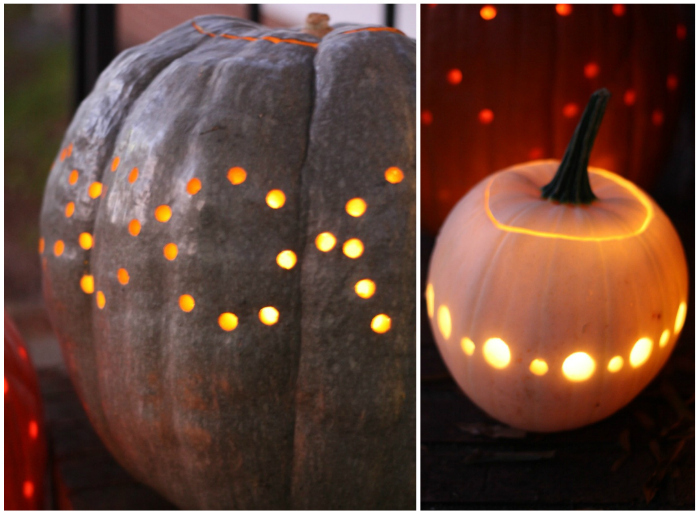 We like to place between 2-3 tea-lights in the bottom of each pumpkin. Top the pumpkins with your topper stems and admire your work! For design inspiration, I searched for drilled pumpkins on Pinterest and decided to go with 4 simple designs: a patterned circle, varied lines vertically and horizontally, and an argyle or diamond shaped design. You can really try anything and get creative here. Very cool idea. I wish I had some power tools! A dremmel would work for this - you can get smallish ones - even cordless - for not much. What a simple and clever idea. 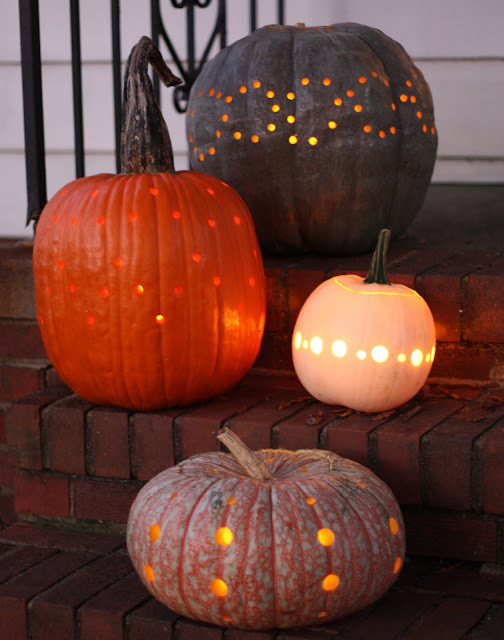 Love the look of your glowing pumpkins! I love this!! (Especially because I'm not very artistic, particularly with pumpkins.) But I can drill holes! Too cool - thanks for this idea. Thanks Kathy! 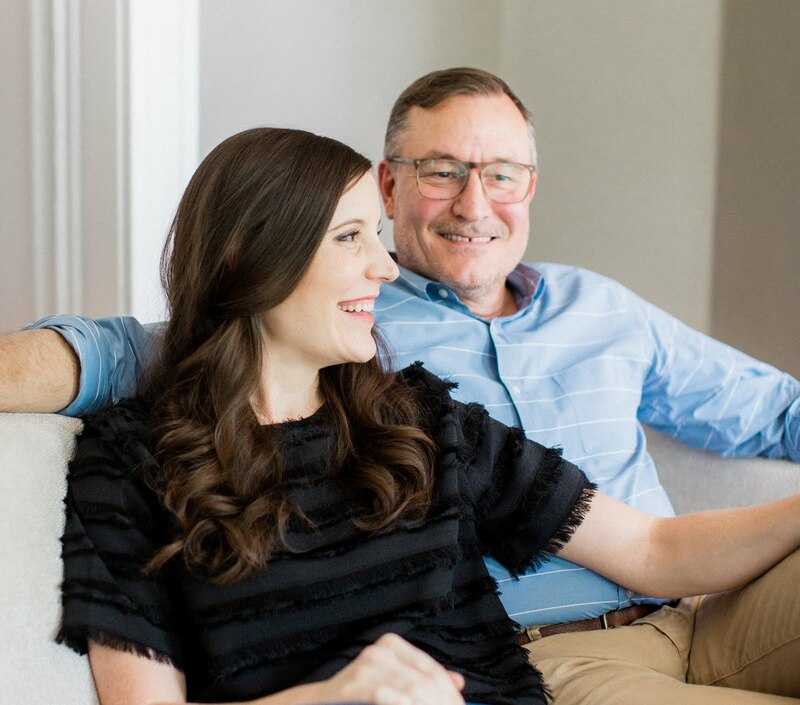 It's a super awesome project that packs a lot of wow! Now we need to think of what we'll do this year! tip: don't forget to smear some Vaseline on the inside to prevent drying out your pumpkin! Very nicely done! Greetings from the Netherlands!